You need almost all of the basic equipment that you normally use when you're rock climbing to safely and efficiently rappel. Here is essential rappelling equipment for rock climbing. Climbing ropes are one of the most important pieces of equipment for rappelling. Most climbers use the same dynamic ropes for rappelling that they use for climbing. These work well but remember that the ropes stretch and that they can be damaged or cut by rock edges. If you’re fixing ropes, such as when you might be working on a long route or a big wall for several days, then consider fixing static ropes for both ascending and rappelling. These don’t stretch and are less likely to be damaged by sharp edges. The standard length for most ropes used in North America is 200 feet (60 meters). A single 200-foot cord, if it’s doubled back on itself, allows for a 100-foot rappel. 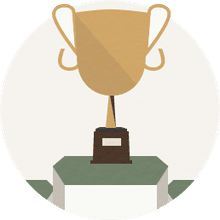 If your rappel is longer than 100 feet or if you’re unsure how long it is, then you will need to use two ropes, which are joined together with one of four rappel rope knots. Always remember to tie stopper knots for safety at the ends of the ropes, so you don't rappel off them. The thicker the rope’s diameter, the better it is for rappelling. Thicker ropes, those from 10mm to 11mm in diameter, have more friction when they feed through your rappel device and are less likely to be cut than skinny ropes. As a general rule, do not tie a thick cord to a thin cord (7mm to 9mm) for a rappel since the joining knot can work itself loose. Rappel anchors are constructed from a wide variety of climbing gear, including cams, nuts, pitons, and bolts. Some anchors also incorporate natural features like trees and boulders. For these anchors, it is best to carry some two-foot slings or pieces of webbing or cord which can be cut to fit. Your choice of rappel device is very important. All rappel devices are not alike and some function better than others depending on your rappelling situation. It’s best to pick a rappel device that you also use as your belay device so you don’t have to carry extra gear. Rappel devices like Black Diamond ATCs and Trango B-52s are excellent choices. Some climbers like to carry a Figure-8 descender since they’re easy to use and offer a smooth ride down. I find that it’s just another piece of gear to carry; that the ropes can run through it very fast; and that it often introduces kinks in your rope, leaving you a twisted nightmare to uncoil at the next rappel station. A Petzl GriGri works fine for single-line rappelling but is more complicated to use with double ropes. Lastly, make sure you have a sturdy extra-large locking carabiner, preferably an auto-locking one, to attach the rappel device to your harness. A screw-gate carabiner works fine but it can unscrew and open under load so it’s not as safe as the auto-locking carabiner. You want to always use a climbing harness when you rappel. 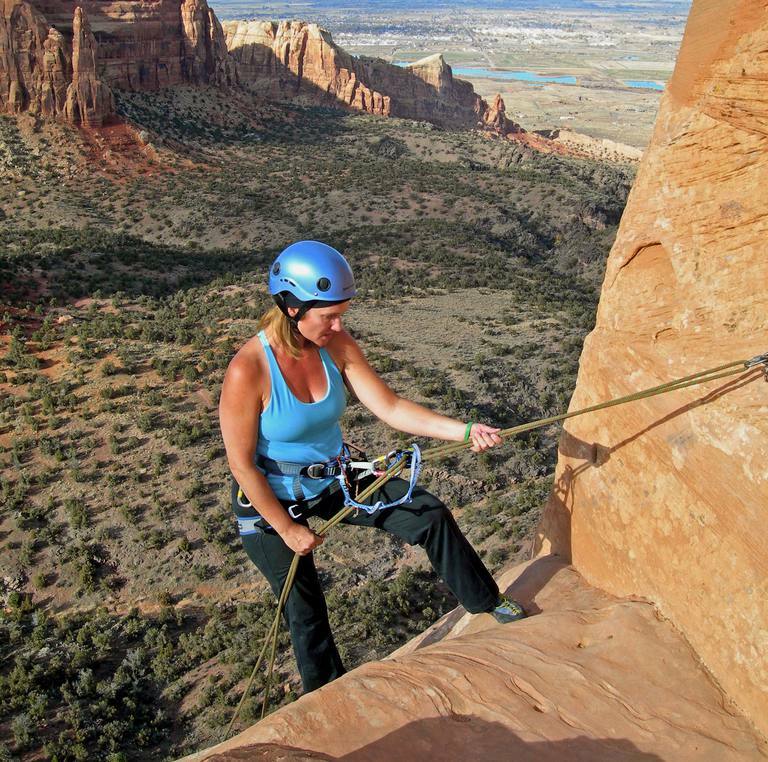 A harness, fitted around your waist and upper legs, forms a comfortable seat for rappelling. Make sure the harness snugly fits your waist, is in good condition, and has, if possible, a belay loop on the front. If you don’t have a climbing harness, then you can make one from webbing, or in a pinch use a length of webbing to improvise a diaper sling or a two-foot sling for a figure-8 sling. To be safe when rappelling, you should always use an autoblock knot as a safety back-up in case you lose control of the rappel or need to stop mid-way down. To tie an autoblock you need a sling or length of cord that is 18 to 24 inches long and a locking carabiner to attach the sling to your harness leg loop. Go to How to Tie and Use an Autoblock Knot for all the info on tying and using an autoblock. While they are not essential, many climbers like to use either one or two leather gloves on their hands when they rappel. Gloves keep you from getting possible rope burns on your hands if you rappel too fast as well as keep your hands from getting dirty from rope contact. I never use gloves because it is one more thing to carry when climbing and because if I’m rappelling so fast that I need gloves, then I’m rappelling too fast. And the dirt washes off! Good belay and rappel gloves are Petzl Cordex Gloves. Another piece of useful rappelling gear is a personal anchor tether, also called a personal anchor system or anchor chains, like a Metolius Personal Anchor System (PAS) or a Bluewater Titan Loop Chain attached to your harness. If you’re making multiple rappels down a cliff, going from rappel station to station, then you need to be able to immediately clip yourself into the anchors when you reach the bottom of each rappel. If you have a personal anchor tether already rigged on your harness, then you can clip into the anchors as soon as you reach them. Then, since you’re safe, you can unhitch from the rappel device and the ropes so your partner can rap down and join you. It is inadvisable to use a daisy chain since they can fail under load. What are 6 Essential Skills for Rappelling? How Do You Tie and Use a Prusik Knot for Climbing? What is the Essential Equipment You Need for Toprope Climbing?